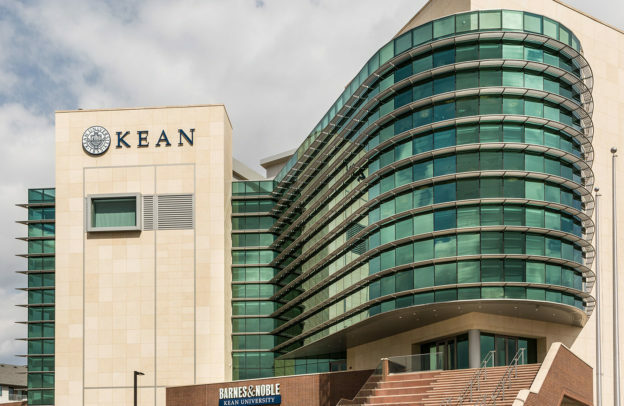 Kean University is a cosmopolitan university serving undergraduate and graduate students in the liberal arts, the sciences, and the professions. The University dedicates itself to the intellectual, cultural, and personal growth of all its members – students, faculty, and professional staff. In particular, the University prepares students to think critically, creatively and globally; to adapt to changing social, economic, and technological environments; and to serve as active and contributing members of their communities. Founded in 1855, Kean University is a public institution with an undergraduate enrollment of nearly 12,000 students. Its suburban campus setting encompasses over 185 acres and is in Union County, New Jersey, about 30 minutes from New York City and 90 minutes from Philadelphia. The university offers nearly 50 different undergraduate majors and more than 30 master’s programs, including those in the fields of health and public administration. Proudly, the school produces more teachers than any other university in the state. Kean University also presents professional theatre, dance companies, concert artists and family-focused shows all year round. Due to the popularity of these performances, Kean tabled and approved the construction of a new multi-use building that would house a state of the art auditorium that could meet the future and changing technical and audio-visual demands of the school and its students. 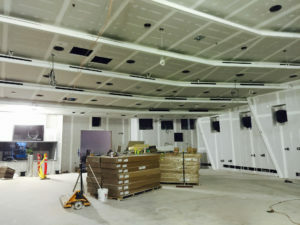 The auditorium was designed to seat approximately 500 – 600 people and to handle overflow in an additional campus-based entertainment / educational venue. 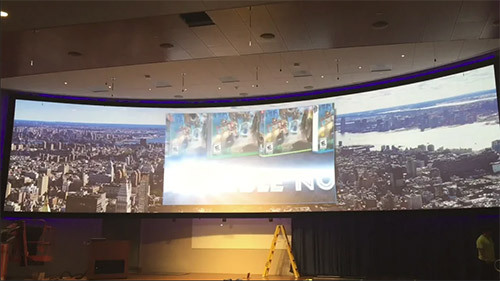 The original project called for the room to support a massive film screen that would provide a 3D experience and include a large center projector, as well as three Barco HQ35 35,000 lumen high-end projectors. The intention for the auditorium space was to create a space that could visually and acoustically provide a venue for choral or musical performance that could instantaneously mimic another venue at the touch of a button. Because of the complexity of the project, Kean understood that the expertise of a knowledgeable technology and integration AV team would be paramount to the project’s ultimate success. 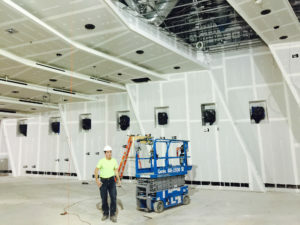 The auditorium project was under the general construction management of Dobco Construction Inc., who, like Kean University, had a long-time, professional relationship with AVSI, LLC, a leading AV system integration firm in nearby Edison, NJ. Having worked on many successful, high-profile projects previously and because of their familiarity with the AV systems and the University itself, AVSI was the obvious choice to become the technology and integration partner for the project. Founded in 2001, AVSI LLC has provided professional audio-visual and video conferencing expertise to the education vertical as well as to many other vertical markets within the private and corporate sector. Offering a full range of services to clients and end-user, they often act as the single point of contact during design and project implementation. 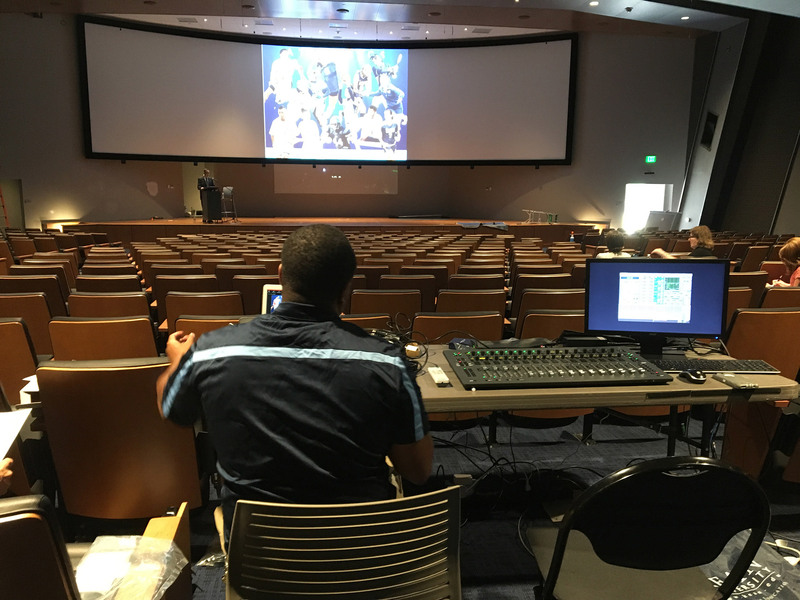 Familiar with the size and scope of the Kean University project, AVSI President Robert Leggio chose the firm’s VP of Engineering, Mike Venditte, to manage the complex audio, rigging and sound system requirements for the project. 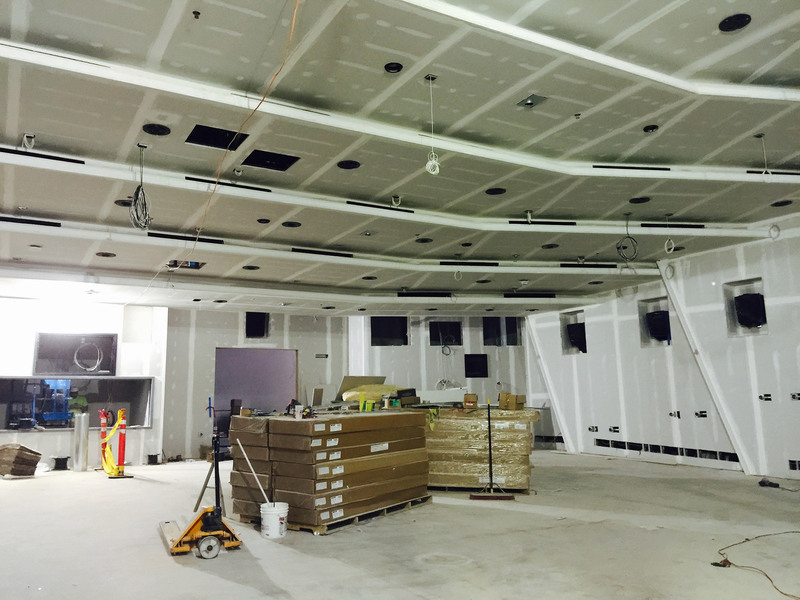 To keep the project on budget while never compromising on the customization needs for the space, Leggio worked directly with the tech team at Stewart to engineer a solution and a customized design that was literally and figuratively, seamless for Kean. The project required Herculean coordination to get the enormous screen and the accompanying Meyer’s Constellation Sound System installed in the space. 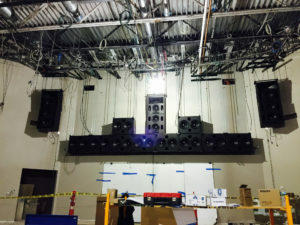 About the project Leggio says, “The whole building was literally being built around that performance theater and a tremendous amount of equipment, speakers and integration had to align perfectly in order to meet the performance specification for the space.” Between the screen and the sound system, this installation was to be the main attraction in this building. 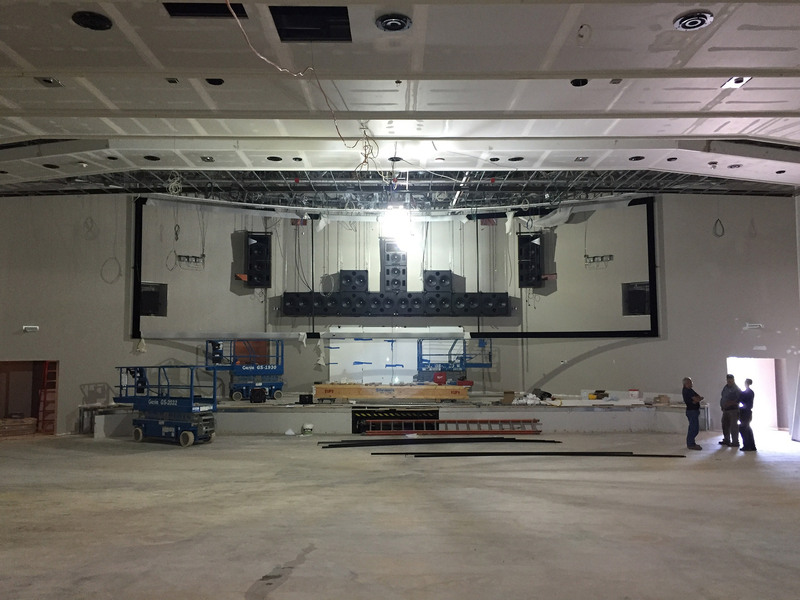 Once completed, the team clearly understood that this auditorium would become one of less than a dozen similar venues in the world and the only facility that could boast a 14’ high and 55’ wide seamless Stewart screen. The project includes hundreds upon hundreds of speakers, in the ceiling, in the walls and behind the screen itself. AVSI installed all of the speakers, projectors and the screen. To meet the spec and to lend to the surround sound experience, the Stewart screen is perforated which enables the sound to directly project through the screen to the intended audience. The project features a Meyer’s constellation and literally speakers are everywhere – in the walls, in the ceilings, and behind the massive screen. To add to its available performance spaces, Kean University approved the build out of a new auditorium for students, faculty and community use. 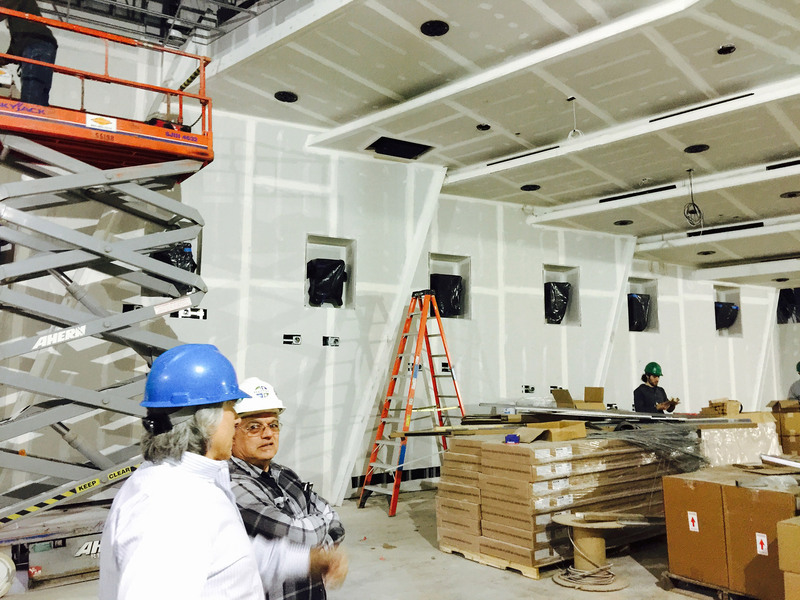 The state of the art auditorium features an oversized, seamless, perforated Stewart Filmscreen as the focal point of the room. 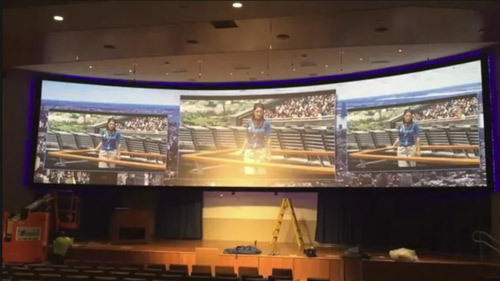 Hanging fourteen feet off the stage height, the screen is a massive 14’h x 55’ wide of optically immaculate surface to provide excellent visual and immersive entertainment experiences. 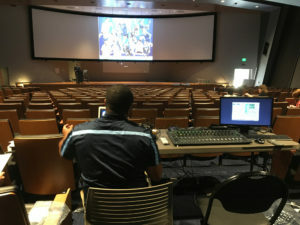 Working behind the scene and the screen are (3) Barco HQ35 lumen projectors with e-processors that are blended and warped because the screen is curved. Within the space, the 3D is accomplished and all the warps and blends and multiple imaging processes are done via a high end video processor, the Barco E2 Event Master Processor. The space delivers Kean University the chance to boast a world class performance space and theater capable of highend performance. With that kind of stage “calling” there is no telling the level of talent the university will be able to attract from famous artists and concert pianists to producing an opera. Indeed, for Kean University and their new Stewart Filmscreen, the sky is the limit. Stewart Filmscreen would like to thank Kean University and Robert Leggio, President and Senior Manager of AVSI, LLC for their assistance in creating this case study. AVSI, LLC provides clients with the best quality Audio / Visual communications systems, consult, technical support, and implementation at the best value. Their passion is in transforming how employees, communicate and collaborate. The firm maintains offices in Edison, NJ, Havre DeGrac, MD and San Francisco, CA. Robert Leggio has been an officer with several major audio-visual companies since 1985. Having extensive audio equipment knowledge, as well as superior executive skills, Robert brings AVSI to an elite level with high standards. Robert stands as a key link between clients and the technical data, making any business transaction with Audio Visual Systems a smooth and efficient one. As the senior manager of AVSI, Robert is committed to making every project a success as the prime focus. Robert offers expertise in: Executive Management, Equipment Specification Preparation, Audio-Visual Environments. He is CTS Certified, Telepresence Certified, also holds certifications in environmental aspects of room planning. their respective owners, all rights reserved.